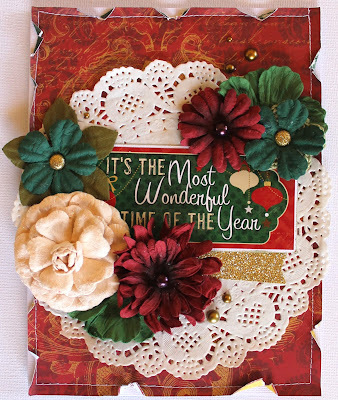 We know that many of you have started your seasonal card crafting. We want to share ideas for all the beautiful cards that you will be frantically making in the next few weeks! Learn a few tips tricks from our fabulous design team! 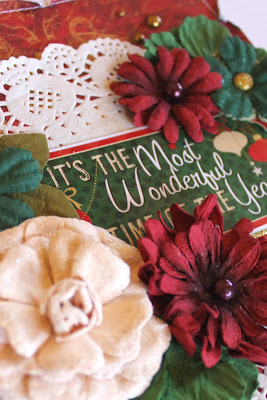 To create this card, I've done a little fussy cutting and add some touches of jewels to it. I've kept this card simple and clean by just adding some pearls, lace and stickers to it. Gold, forest green and burgundy are synonymous with a Christmas full of tradition and wonder , so using the BoBunny Silver & Gold collection helps to mimic that traditional feel that so many of us like to use. For me at the moment I have a huge obsession with the BoBunny blossoms and am finding reason to use them everywhere. So when I had to create a card for my grandmother who is a gardening enthusiast I just had to use as many flowers as I possible could. I also made this card a little larger than usual so that I can place a few packets of flower seeds in there as a little surprise. The glittery shimmer that can be found on some of the blossoms are a perfect addition to a Christmas theme. Wow-these are all stunning!Absolutely gorgeous-thank you so much for sharing them with us.